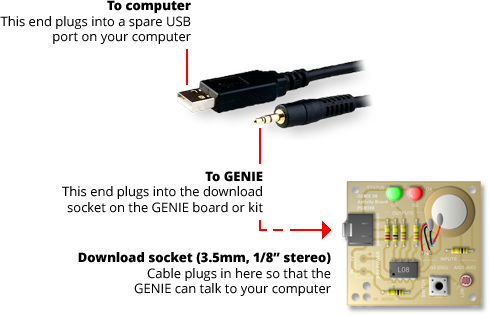 The GENIE USB Plug & Play Cable connects your computer directly to a GENIE board or kit, thus allowing your flowchart or BASIC programs to be downloaded without the need for an expensive programmer. To learn how to purchase a GENIE USB Plug & Play cable, please see our Sales page. On each GENIE board or kit you will find a download socket (which looks like a 3.5mm stereo audio jack socket). You should plug the cable into this socket whenever you are ready to download your program; the cable's Plug & Play technology will connect to the GENIE as soon as the cable is plugged in. If you have problems connecting or downloading to a GENIE circuit, please see our Troubleshooting section for help and assistance. If you are using the GENIE USB Plug & Play Cable for the first time, you will need to prepare your computer. This will involve installing special information (known as a Microsoft Windows device driver) that tells your computer how the cable operates. Normally the driver is included automatically when you install the Circuit Wizard 3 or GENIE Programming Editor software. However, should you need to install the device driver separately, you can access the various resources provided here. Note that the device drivers provided below will not work with third-party cables. To learn more about installing a GENIE device driver, click on the link below. Click here for help on getting your cable ready to use. Below are the device driver downloads. These come in two forms: the first provides an automatic installation Wizard; the second, for more advanced users, is a compressed (.zip) archive containing the raw Microsoft Windows driver files. Download the GENIE Driver Installation Wizard. Download the files required for manual installation.